Jesus said “Let the little children come to me.” The children and youth are not the future of Graystone Church. They are a big part of Graystone Church NOW. I thought all the kids did great yesterday in the Christmas Program. I was very impressed with the preschoolers quoting John 3:16 and for the kids who quoted passages out of Luke. We really do have the most beautiful, talented, and gifted kids in all the world. I was also impressed with the actors/actresses and all the memorization they had for The Christmas Hang Ups Production. It was a clever story and a tremendous message. And all the singing was great. You know that Taylor Swift and other singers got their start in children’s church productions. Just sayin. A big THANK YOU goes out to Katie Landress, our Children’s Pastor, and all the staff and volunteers who helped with the children’s program. It was an AMAZING service. It was also great seeing so many old people at Graystone. It made me feel a little younger. I heard that our high schoolers made some big decisions at Windy Gap and our entire GSM is moving forward spiritually. Another THANK YOU goes out to Nate and all our of staff and volunteers who took the students to Winter Retreat. I cannot wait until Joelan and Julia are old enough to go! BTW, Jessie will be old enough (3 years old) for the Children’s Christmas Program next year. Let me just go ahead and warn you that it will be out of hand with her and her buddies…Inlow, Hollandsworth, Hale, Wilson to name a few. Did I mention that the Graystone Kids are the most beautiful and gifted kids in the world? OK, I might be a little biased. 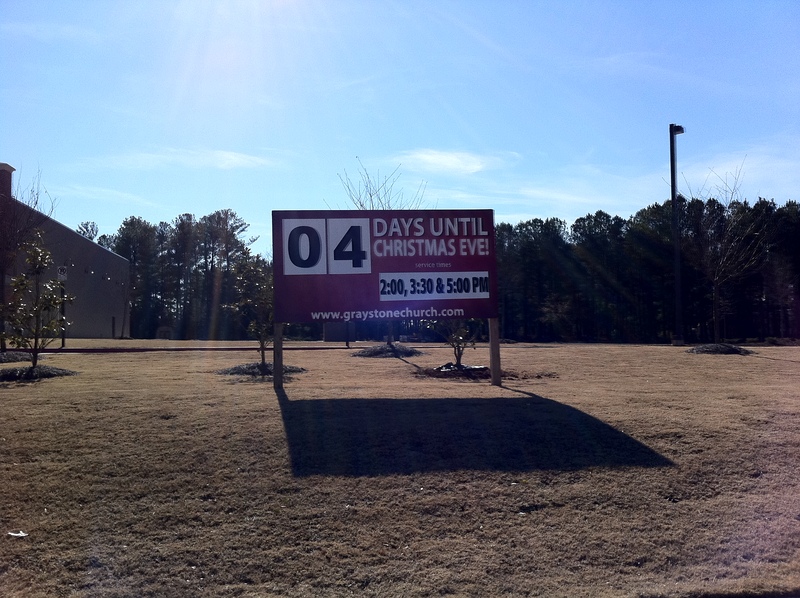 Christmas Eve Services are in 4 Days!!! I’m extremely pumped about my message, the music, the candlelight service, and a surprise or two. Over 200 people on FACEBOOK are already signed up to come. I’m wondering if YOUTUBE will be there? It is history in the making that we are having our first ever service in Spanish. BTW, I will not be preaching that message. Luis will have the honor. The Front Room (the room formally known as the Gym, All Stars Room, and GSM Room) is getting renovated and will be ready for Christmas Eve. It looks great BTW. It will be a 100-200 seat auditorium/ multi-purpose room. Are you ready for Christmas? I ordered Jennifer’s Christmas gift from www.slamglam.com. Honestly, Jennifer ordered it herself. Yesterday, I was giving the elementary age kids some suggestions for Christmas gifts for their pastor (Xbox, ipad, cold hard cash) and Hannah Hairston said, “Do you have any less expensive suggestions?” Kids. I weighed in this morning at 207.5 pounds. I worked out 5 days last week and gained half a pound. It does not look like my 199 goal for Christmas Eve is gonna happen. It was a pipe dream. On a more devastating note, Adrian Peterson laid an egg last Monday night for the MS Mullets and only gained 26 yard (2.6 points). I lost 79.60 to 79.46 to the lowly 7th seeded Shack’s Falcons. In the words of my kids, I am now in the constellation bracket. My attention has turned heavily to ESPN College Bowl Mania and the “We Are Family Bowl Pics”. Also receiving votes: Jenn’s parents fly in tonight; new space heater; Nate is excited about Neil Diamond on Sing Off; I’ll preach in a mustache if the Falcons make it further in the NFL playoffs than the Saints…more likely, Nate will be shaving his head; Sugarland and Brad Paisley are tentatively on the January Set Lists, The Cam Newton of 2011 signs with LSU, Go Ducks!!! 2011 Graystone Christmas program is gonna be c.r.a.z.y.